Colin with his 200 lb Ahi! 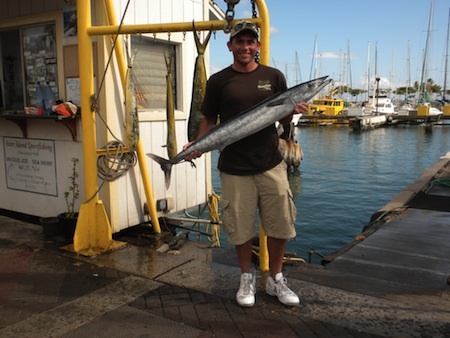 Mahalo to Colin for choosing Maggie Joe Sport Fishing! Colin joined Captain Randell aboard the Ruckus on a full day sport fishing charter. 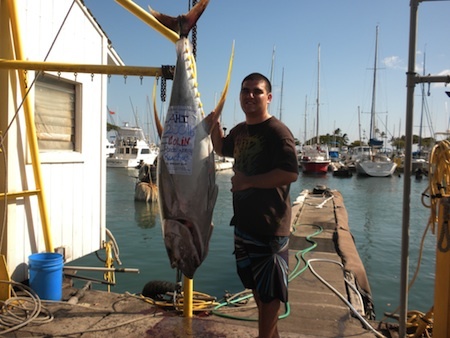 He hauled in this nice 200 lb Ahi while deep sea fishing outside of Honolulu, Oahu! Aloha! Justin with his buddies, Captain Mark and Mate Mikey! Justin with his 510 lb Blue Marlin! 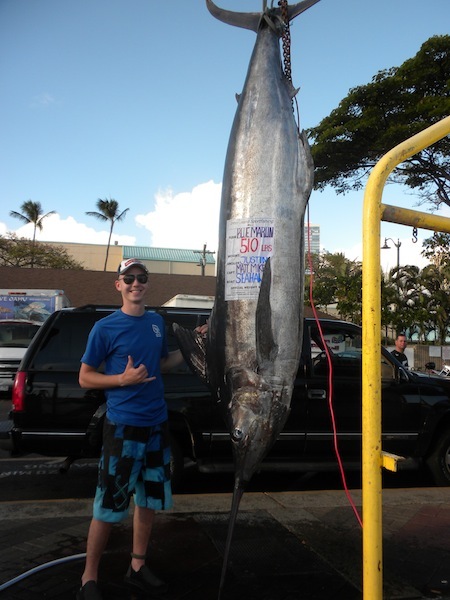 Big Mahalo to Justin for choosing Maggie Joe Sport Fishing! It was a heck of a day out on the water aboard the Sea Hawk’s sport fishing charter. Captain Matt and Mate Mikey didn’t disappoint as they found the first big Blue Marlin of the summer season. Justin did his part as he reeled in this beast of a fish after hopping in the fighting chair. Hana Hou and Aloha! Sam, July and Michael with their catch! 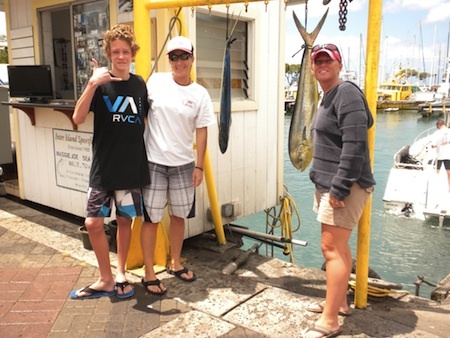 Mahalo to Sam, July and Michael for choosing Maggie Joe Sport Fishing! 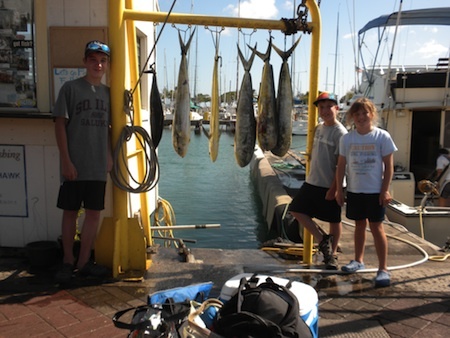 The kids joined Captain Matt aboard the Sea Hawk on a sport fishing charter. 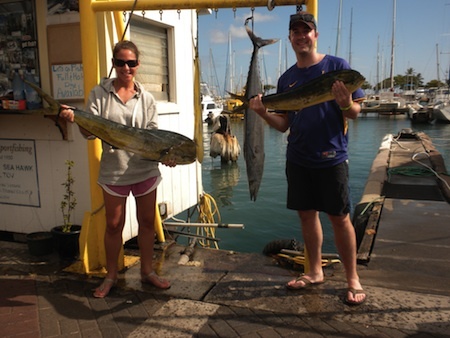 While deep sea fishing outside of Honolulu, Oahu they hauled in 5 Mahi Mahi and 1 Aku! Aloha! Vanessa and Kevin with the catch! 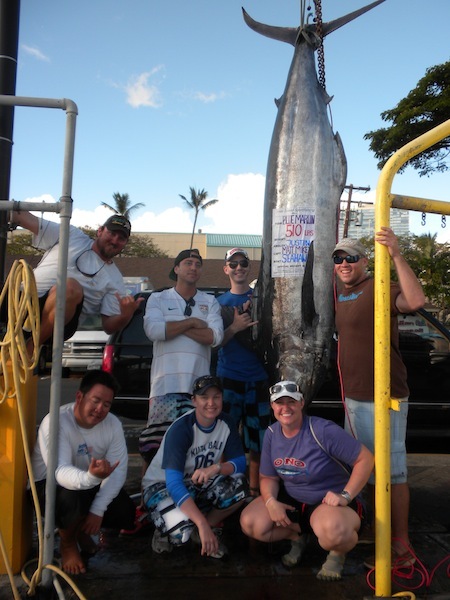 Mahalo to Vanessa, Kevin and Greg for choosing Maggie Joe Sport Fishing! The group joined us on a shared sport fishing charter. It was nice day out on the water with Captain Randell and they hauled in 2 Mahi Mahi and 1 Ono while deep sea fishing outside of Waikiki, Oahu! Aloha! Marcus with his 165 lb Blue Marlin and Alfred with his Ono! 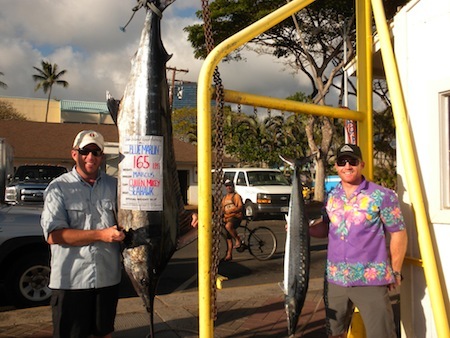 Mahalo to Marcus and Alfred for choosing Maggie Joe Sport Fishing! The guys joined Captain Matt aboard the Sea Hawk on a sport fishing charter. Marcus hauled in this 165 lb Blue Marlin while Alfred bagged a nice Ono while deep sea fishing outside of Honolulu, Oahu. Hana Hou! Brennan and Tyler with Ono and Aku! 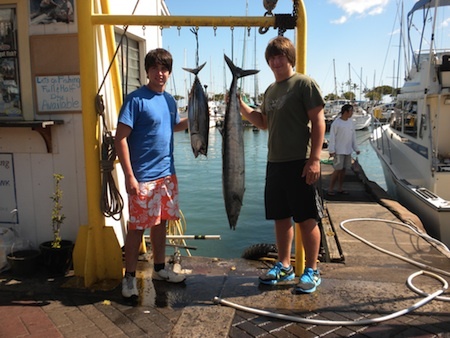 Mahalo to Brennan and Tyler for choosing Maggie Joe Sport Fishing! The pair joined us aboard the Ruckus on a sport fishing charter. 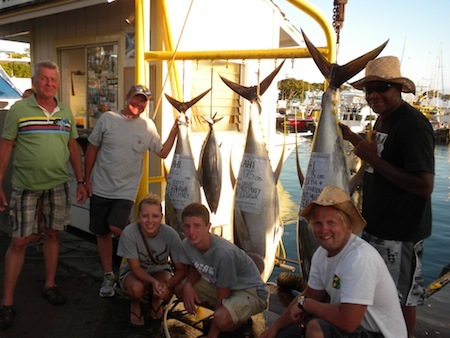 They hauled in an Ono and Aku while deep sea fishing outside of Oahu, Hawaii. Aloha!